The Hurricane Watch which was issued for Dominica on Tuesday 11 September 2018 was discontinued as of 11 p.m. that night. The island has since been placed under a Tropical Storm Warning ahead of Tropical Storm Isaac. A Tropical Storm Warning means that tropical storm conditions are expected somewhere within the warning area within 36 hours. The weather update from the Dominica Meteorological Service stated that at 8 a.m., the centre of Tropical Storm Isaac was located near latitude 14.4 degrees north and longitude 54.1 degrees west or about 484 miles east south east of Dominica. Isaac is moving west near 15 mph (24 km/h). Maximum sustained winds remains near 60mph or 95km/h with higher gusts. Tropical storm force winds extend out to 105 miles (165km) from the centre. Isaac remains a disorganized system and its structure is expected to degrade further as it approaches the islands. On the current forecast track, Isaac is expected to pass over or near to Dominica, Thursday afternoon. Tropical storm conditions (39-73mph) are expected to spread across Dominica from early Thursday morning. Residents are advised to keep informed on the progress of this system and to remain vigilant. Preparations should by now be completed or rushed to completion, regardless of the intensity forecast. 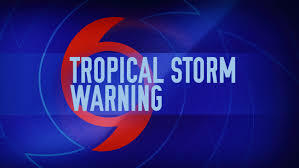 A deterioration in weather conditions is expected across Dominica Wednesday night, increasing to widespread moderate to heavy showers, thunderstorms and winds gusting to tropical storm force by Thursday morning. Rough to very rough seas are expected to begin affecting Dominica by Wednesday afternoon through to Friday.